Many times, people look up at actors, artists and investment guru’s as some kind of Gods. They admire their work, their ambition, dedication, and everything that has led to a masterpiece of which they were big fans. At the same time, a lot of people fail to realize that they are just humans, which means they are bound to do mistakes and even bad deeds. Jordan Belfort is a great example of – he published the well-known “The Wolf of Wall Street”, but he has also been involved in a lot of fraud and related crimes. Now, at 56 years of age, despite everything he’s been through, he still has a considerable amount of net worth. 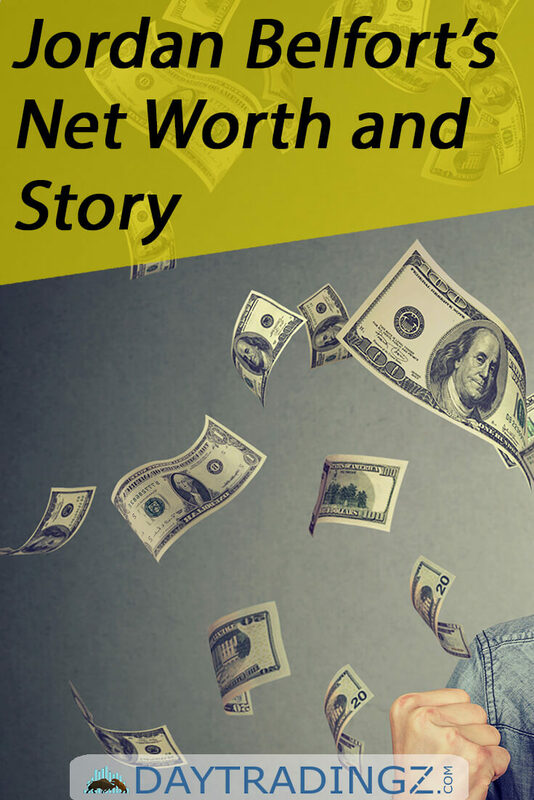 Are you eager to discover the Jordan Belfort net worth, and find out more about his life and the things he’s done? If that’s the case, then keep on reading. Jordan Belfort was born in Queens, New York, back in 1962, and he’s an author, former stockbroker, and motivational speaker. He became famous through his investment firm – Stratton Oakmont – by swindling millions of dollars from investors back in the 90s. He’s also known for publishing his memoir, “The Wolf of Wall Street”, which had a movie adaptation starring Leonardo DiCaprio. He's also known for the crimes he took part in, including fraud and other related things. They are connected to stock-market manipulation and he also ran a boiler room as part of a penny-stock scam. His actions, for which he pleaded guilty, have resulted in him serving 22 months in prison, as well as having to pay more than one hundred million dollars in fines. Given all his fame and success back then, it’s only normal to wonder: how much money did Jordan Belfort make? ​After all, it must have been a considerable amount of money, given his writing career and career as a businessman. Well, before he got serious, Jordan Belfort first ventured into selling Italian ice with one of his friends, which ended in making a profit of $20,000. Initially, he wanted to use the money for a dentistry degree, but he changed his mind and instead started up some ventures that included a meat and seafood company, which failed. After spending a lot of time with other companies from which he acquired plenty of information, he founded Stratton Oakmont, in the early 90s. With around 1000 brokers, it had assets that were worth over $1 billion. After “The Wolf of Wall Street” was adapted into a film, it was said that he made over $2 million from the rights he had over his 2 books and the movie. It’s also been said that the Red Granite productions had to pay millions to obtain rights to the story in order to adapt the movie. However, Belfort didn’t want to admit that he asked for money in return for the rights. It was believed that his income for the last years was about $50 million to $100 million per annum, taking all his wealth and current ventures into consideration. Conversely, his net worth is in the negative because he’s indebted to the tune of more than $100 million in reparative damages. Jordan Belfort’s net worth is something that’s been discussed a lot given his wealth over the years, his success and his crimes. Considering the time spent in prison and the money he has to pay to the victims, you’d think that he barely has money to live his life normally anymore. Despite all these, it seems, that he still lives in luxury, and has enough money to pay back to his numerous victims. Now, he works as a motivational speaker, because he isn’t allowed to work in the financial security industry anymore. Therefore, this is a great way for him to get his money back. That being said, if you’re wondering: “what is Jordan Belfort’s net worth?”, you should know that it’s about $100 million currently, as he is traveling the world and working as a motivational speaker. Not too “bad” after all he’s been through. Jordan Belfort used to have a house in Old Brookville, on the North Shore of Long Island. However, he didn’t get to enjoy the house anymore due to the fraudulent activities he was involved in, as he had to pay for what he did. Having said that, after he was asked to pay the stolen $110 million from investors, his old house was taken over by the Federal Government and sold in 2001 to pay back some of his victims. The house was palatial and had 8,706-square-feet. It was put out in the market for $3.4 million. It sits on two acres of land space with an impressive two-story foyer, as well as a ballroom-sized living room, double-oven, and many other luxury amenities. It’s not unheard-of Belfort’s way of life, which involved many parties held in his mansion. Furthermore, the mansion had an in-ground pool, as well as a separate pool house. This already makes a great attraction for those who are into big parties. As mentioned, Jordan Belfort doesn’t own the magnificently built house. Nowadays, he resides in a house in California, Manhattan Beach, together with his partner, Anne Koppe. If you’ve watched the movie “The Wolf of Wall Street”, you’re most likely aware of the yacht and its story. Basically, the movie features a scene of Belfort surprising his wife with a yacht that features her name on it. In the movie, her name was changed from Nadine to “Naomi”. The interesting fact behind this scene is that it actually happened in reality as well. Just like in the movie, he referred to his wife as “The Duchess of Bay Ridge” and, out of love, he named his yacht after her. However, the yacht, originally owned by Coco Chanel, sunk off in the Mediterranean storm. When this happened, Belfort made a bad decision, and he insisted on being the captain of the boat through a storm. Obviously, it didn’t turn out as expected. Furthermore, they had to push the helicopter off the top deck of the boat as well, in order to make room for the rescue chopper so they could drop down an Italian Navy commando. However, if you’ve just heard about Jordan Belfort, you might not know whether the entrepreneur has a wife or not. Jordan Belfort wasn’t married only once. Actually, he had two marriages, and his first one was with Denise Lombardo. Indeed, Denise Lombardo was his first wife, but the marriage didn’t last for a long time. After four years, they separated, and even though she wasn’t the one holding the hand of the famous Belfort, she still gained a fan following. Denise Lombardo didn’t reveal her personal information and Denise Lombardo’s net worth, but she still has a good professional life that she’s known for. Once she divorced Jordan Belfort, she finished her studies and then got her degree, after which she had various jobs, including working in the sales department as a flooring specialist. She became a real estate agent back in 2010 and has remained so ever since. After a while, in 1991, Belfort got a second marriage, with a woman named Nadine Caridi. She is a former British model who got famous after she married the entrepreneur. Nadine Caridi was introduced to him in one of the parties he used to throw at his house. Her then boyfriend, Alan Wilzig, was the one introducing her. Soon enough, the spark began, and the two started being attracted to each other. After Jordan Belfort’s first marriage ended, the two got married. Although it all seems like a fairytale romance, the marriage got to the bad side of things. It’s being said, that Jordan Belfort started abusing substances and having affairs with other women. Despite having a marriage that resulted in two children, the two separated because of his actions – and this includes his fraudulent activities and issues with the law. A year later, in 2005, their divorce was finalized, and Belfort apparently regretted the way he treated his former wife. Later on, Nadine Caridi married a former New York entrepreneur and CEO of Wizard World, John Macaluso. Now, she lives a happy, worry-free life. Named after Jordan Belfort’s nickname, “The Wolf of Wall Street” is a memoir that he has written and published in September 2007. It talks about his life and the creation of Stratton Oakmont, which was a brokerage house that engaged in pump and dump schemes with penny stocks. In the 1990s, the company had to be shut down by regulators, and it ended with Belfort being jailed for fraudulent activities. The greatest success of the memoir came after it was adapted into a movie. Written by Terence Winter and Martin Scorsese, the movie became a big success, especially since Leonardo DiCaprio played the “wolf of Wall Street” and did a magnificent role. Margot Robbie played the role of his wife, Nadine Caridi, whose name was changed to Naomi in the movie. In order to gain rights for the movie, there was some kind of bidding between Leonardo DiCaprio/Warner Bros and Brad Pitt/Paramount Pictures. Also, it’s said that Jordan Belfort made $1 million on the movie rights. After being engaged in so many fraudulent activities, Jordan Belfort had to spend 4 years in prison, which were reduced to 22 months. Moreover, he had to pay $110 million to the many victims of his frauds, but rumors say that his debt is not fully paid yet. Nowadays, he works as a motivational speaker, which is why he is traveling around the world a lot. In regards to his personal life, he is living with his partner for over a decade, Anne Koppe. Although she’s already a businesswoman, mother and many more, she got most of her fame after she married Jordan Belfort. The two met in 2008, and with every year that passed, their bond has grown and evolved into what it is today, with the two being engaged. Their relationship is long-lasting, and despite all the obstacles in their way as a couple, they always emerged stronger than before. Jordan has declared that he feels very lucky to have her, as she is the one that is cautious at everything and everyone they associate with. Today, Jordan Belfort’s net worth is roughly $100 million, and he still lives a good life in a house in California. As you were able to see, Jordan Belfort has had a life full of adventures. He was involved in two marriages, he had affairs, drug problems, and he was conducting frauds on investors. His actions led to him being imprisoned and having to pay atrocious amounts of money back to his victims, to which he still owes a lot of cash. His story is featured in one of the best wall street and finance movies of all times, The Wolf of Wall Street. However, Jordan Belfort’s net worth is still enough to let him have a good life. Now, it’s up for you to decide whether he’s someone to look up to for everything he’s done and overcome.